Major Dickie Head looks bemused as we emerge from the safety of an armoured Iraqi Army Humvee and walk towards what was one of the most dangerous parts of Basra - now a small, but busy, market. This is the first time he has returned to this area since a tour of duty which saw him and his men engulfed in a vicious and lengthy battle near the city centre. His unit was trying to recover the bodies of the five British service-personnel killed when a Lynx helicopter was brought down by insurgents on 6 May 2006. 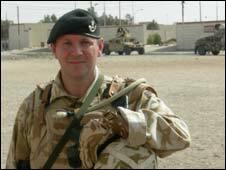 Maj Head, 40, was commanding B Company from 1st Battalion, The Light Infantry. "It's quite staggering," he says, removing his hard helmet and replacing it with his Army beret and looking around warily. "We used to patrol through here in a Warrior [infantry armoured fighting vehicle] and you wouldn't have worn a beret then. "Most of us wouldn't have come here then except in 6 Warriors with 55 heavily-armoured blokes in the back, and even then we'd be twitchy." As we walk through the market, attracting a crowd of rowdy children, Maj Head laughs incredulously. "This is a quantum leap forward. The biggest problem I have here now is small children trying to nick my pen and sunglasses. 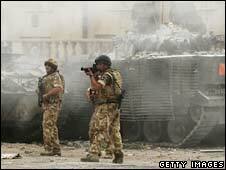 "When I left in November 2006, the main problem was IEDs [improvised explosive devices] and roadside bombs. If it stays like this, it'll be fantastic." In the midday heat, the market in the Hayaniyah area - once home to many of Basra's insurgents - is fly-blown and filthy. The oranges and tomatoes on sale have seen better days, and the stench of sewage is never far off. But it is peaceful and busy, with no sense of threat, even for the small group of British officers we are with - although they still carry their weapons, slung loosely by their side, despite the presence of Iraqi soldiers laughing and chatting nearby. Stall-holders at the market are keen to talk. 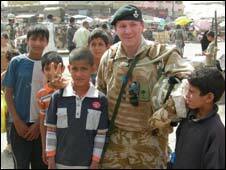 One man thanks the British soldiers for helping to get rid of Saddam Hussein and says that life here has improved. Not everyone around him agrees though. One of the older stall-holders says angrily that Britain and America "only came here to steal our oil". He also rains down curses on Iraq's politicians, past, present and future: "They're all as bad as each other." We get back into the Humvees with the young Iraqi soldiers competing to see who can play the loudest music on their mobile phone as they drive, cigarette in hand with the music blaring out through the open windows. One driver takes a wrong turning, but Dickie Head points him towards the street where the Lynx came down - a location he will never forget. "It's surreal to be back," he says, as he is surrounded immediately by young Iraqi boys, inquisitive and eager to chat. Although they don't share a common language, the boys want their photos taken with the British soldiers, as some of the youngsters pose and pretend to shoot with imaginary rifles, their fingers forming the barrel of the gun. Just three years ago, boys only a few years older were part of the angry mob that surrounded the helicopter crash site that day, in what turned out to be one of the bloodiest weeks of all for British forces in Iraq. "We were stationed up the road in the Old State Buildings and just after midday we heard a huge bang," Dickie says. "My sergeant major was on the roof and reckoned a helicopter had gone down, so we crashed out the Quick Reaction Force and they came here. "There was already quite a big crowd," he adds, gesturing down the quiet, narrow street. "Sergeant Pepper from the Princess of Wales's Royal Regiment, who was commanding a unit from 2nd Battalion, The Royal Anglians, tried to secure this location with his blokes and we got here about 15 minutes after the crash. A spontaneous crowd of Iraqis cheering as they celebrated the crash rapidly turned into a rioting mob. Under a hail of bricks and petrol bombs, British forces used rubber bullets, and as the violence escalated, live bullets, as militants amongst the crowd began to fire rocket-propelled grenades and blast bombs. A video shot on a mobile phone camera that day showed a young man making petrol bombs and handing them out to younger children and urging them to attack the British troops. The Jaish-al-Mahdi insurgents, or the JAM as the Brits referred to them, had mobilised. "After an hour, it was very, very bad, and it got worse," Maj Head says. "Our priority was to recover the bodies of the fallen from the helicopter and get them out. "I could smell burning kerosene in the house - it was dripping down from floor to floor - and the crowds were growing." Outside, the Quick Reaction Force desperately tried to keep the crowds at bay while the bodies were retrieved. Two Warriors were set on fire. Five Iraqi civilians, including two children, were killed in the fighting that day. "I heard huge bangs up the road and I thought the worst had happened when I saw all the blokes there lying down," Maj Head remembers. "Then they all stood up, grinning like idiots, covered in mud, because the blast bombs had landed just short in the river bank, showering them with mud." He walks slowly, almost hesitantly towards the house that became his command centre that day. After a few minutes, the woman who owns it comes shyly down to greet him. They exchange handshakes and a smile of recognition. She remembers him well - and the day that a burning British helicopter crashed through the roof of her home. Yet she seemingly harbours no bitterness, and remembers that the British major gave her money from his own pocket to help repair the roof. Although, as she takes him to see inside her house today, she points out that the roof is still leaking and says life remains difficult for ordinary families trying to make a living in Basra. 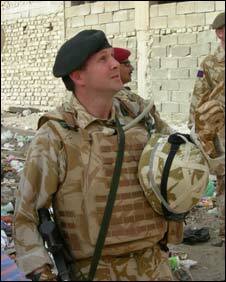 As he stands looking out over the roof, the chaos and danger of three years ago are still vivid in Maj Head's mind. "The helicopter hit the deck over there and you can still see the damage to the wall. There were a couple of insurgents taking pot shots at our riflemen from over there." He points out the spot, which today is another peaceful alleyway. "They started burning tyres and there was lots of black smoke coming over. It was a very hot day, much hotter than today. There was lots of chanting and noise, and bricks and stones being thrown by the crowd, along with the RPGs [rocket-propelled grenades] fired by the insurgents. "Our young men and women did some extraordinary work that day. It was a testing day for everyone. "Not one I'd like to repeat," he adds, with quiet understatement. Maj Head was awarded a Military Cross for his actions, but he says that the honours belong to all those who were there that day, during what he calls his "baptism of fire" in Basra. As he emerges from the house, blinking in the sharp sunlight, the young Iraqi boys are still playing in the dust outside. They offer us a fruit juice. The major seems lost in thought, perhaps remembering the moment of silence he and his colleagues held for the men and woman killed in the Lynx helicopter when they finally managed to bring their bodies back to base that day. "It was a miracle that nobody else was killed or badly hurt that day. The fact we got away in one piece and brought their bodies back was testimony to all the guys' work here." But does he think it was all worth it when he looks at Basra today? "When you see all this, you're much more positive about it," he says, gesturing at the quiet streets around us and the families leading more normal lives. "Some people paid a great sacrifice, some the ultimate sacrifice. I think for them and for their families, it's up to them to decide. "My experience of Iraq until now had been of violence and to see all this, you suddenly realise they're normal people and that this is a place that has a future." Later, he says he wrote an email to his wife after walking around the market. "It has been cathartic to come back and see this place and realise that things have improved and that the efforts and sacrifices of my colleagues were worth it."